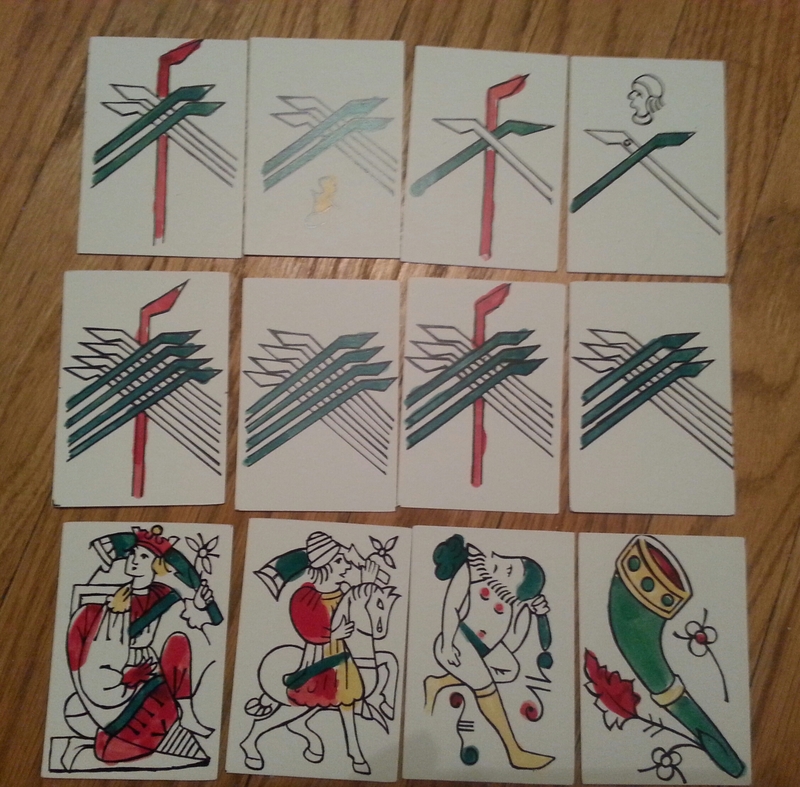 I recently acquired a replica pack of cards made by the Fournier Museum in Vittoria, Spain. 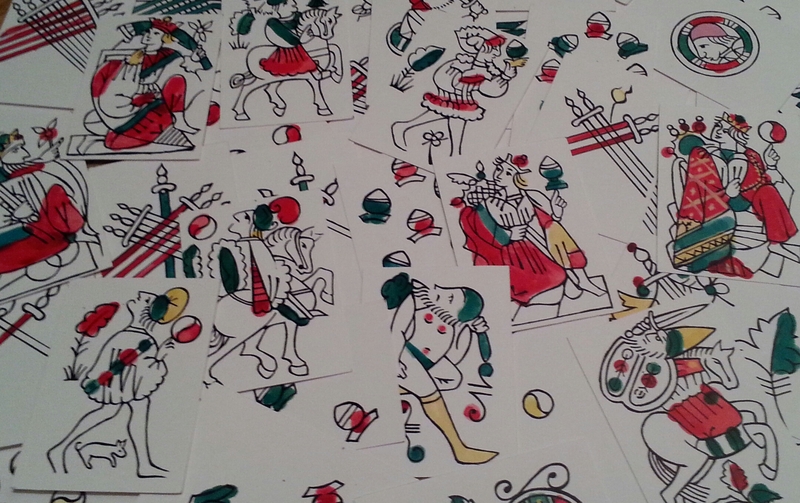 These represent what may be the oldest cards in Europe. Although little is known about them, there is plenty of reason to speculate, as they are littered with taunting clues to the primordial days of European cards. For example, the pack was found in Seville, but the head on the ace of coins sports a hat stylish in Northern Italy at the time. The ‘clubs’ suit seems to have retained the polo stick shape, connecting them to Mamluk cards, as well as Italian-suited packs and the Portuguese pattern (aka dragon cards). The figures wear Gothic and Saracen attire, reinforcing the connection to Arab influences. 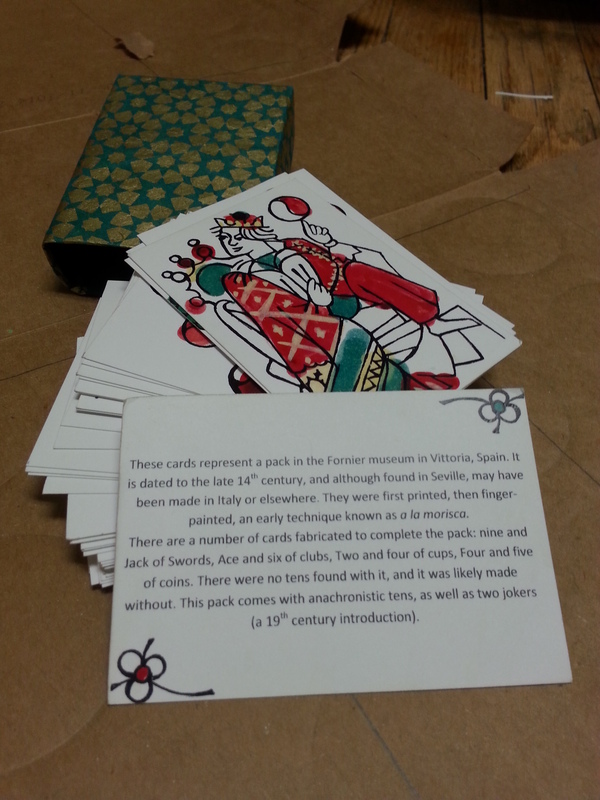 Current estimates (Fournier, 2004, printed on their replica) place this pack at around 1390. The reproduction pack makes no attempts to provide substitutes for missing cards, so it is unplayable. I’m compelled to do something about this. 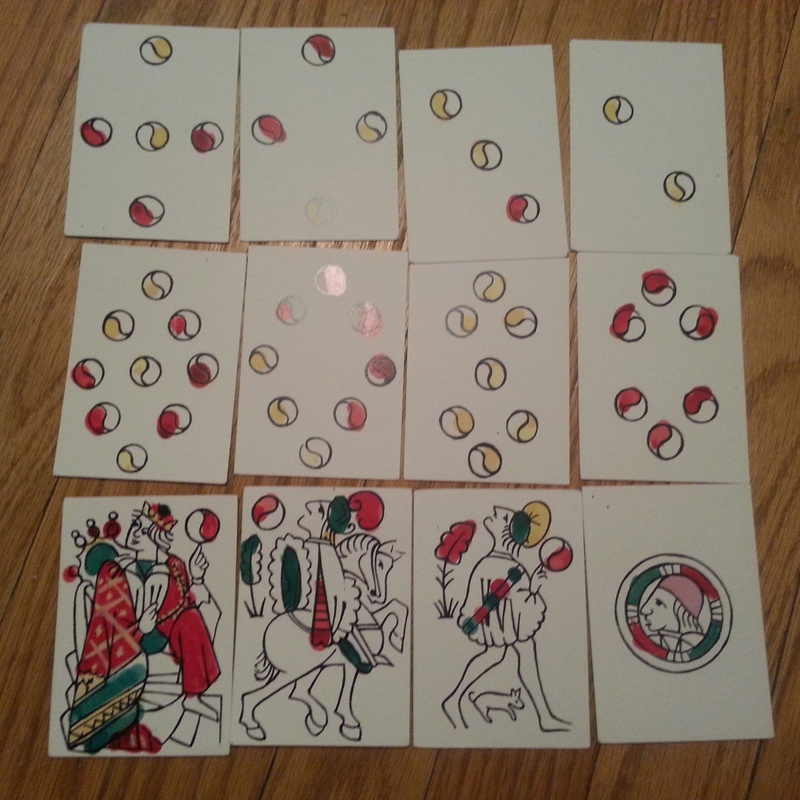 The Moorish, or more correctly, a la morisca pack is constructed much as a modern poker deck, with three court cards for each of the four suits. The suits are now commonly categorized as Latin suited, along with Italian and Spanish suited packs (cups, coins, swords, sticks). They are simple in design and are consistent in pattern, which means the missing non-court cards are easy to replicate. There are no tens in the pack, leading to some speculation: were they lost, removed, or printed without? Their absence suggests games such as Hombre may have been popular very early on. Should this project lead to production, I will likely produce tens. 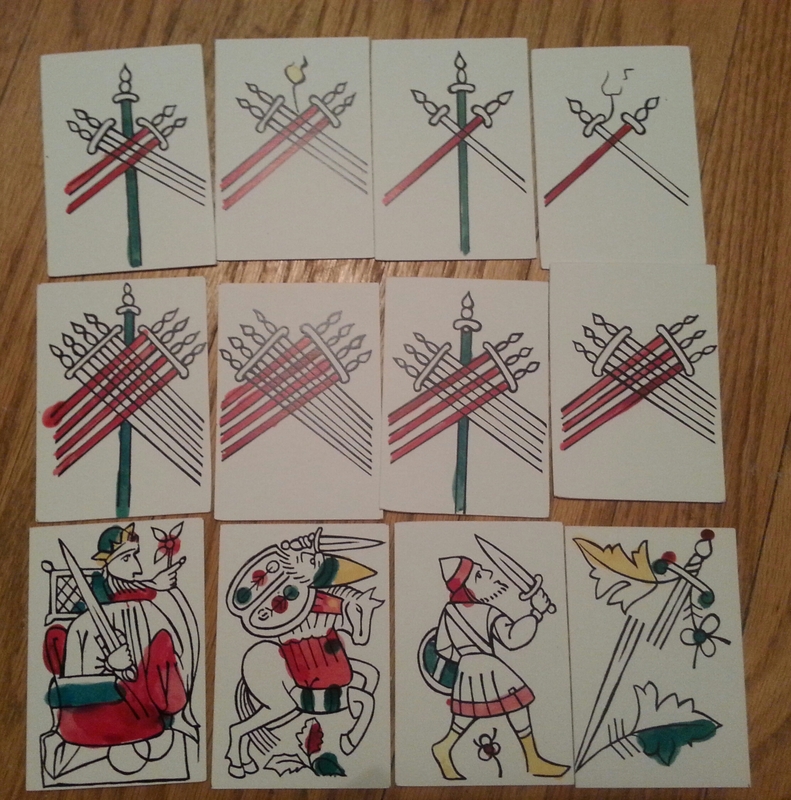 The last two are the ace of clubs and the sota de espade (Jack of swords). As these cards are very early in development, production methods are crude. Pale pink, yellow, rusty red and a heavily oxidized green pigment was applied a la Morisca, which is a nice way of saying finger painting! As much as this makes a production run sound downright fun, it does obscure the already fragile xylographic print. 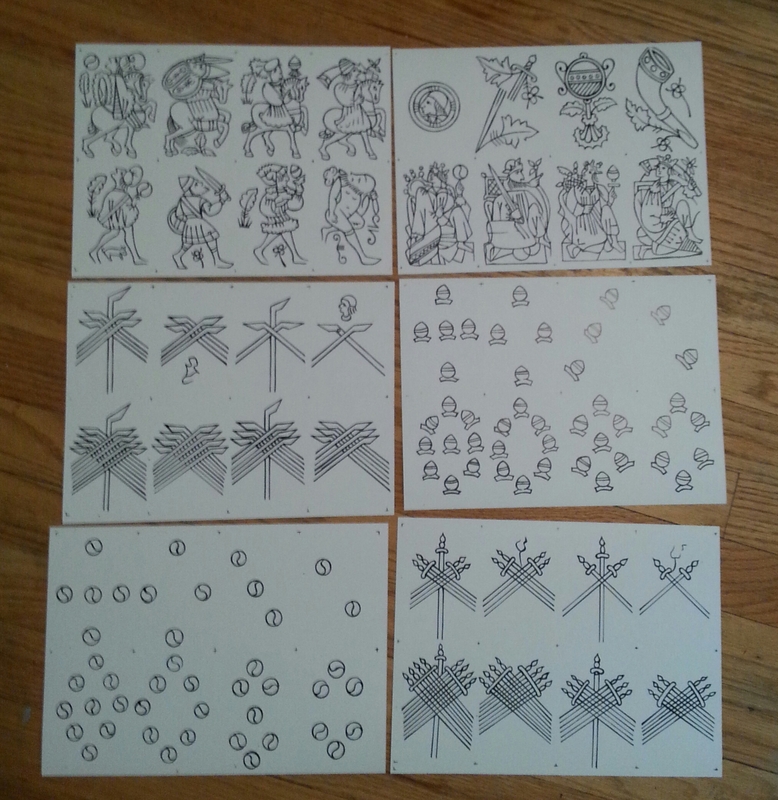 I studied each card carefully, in hopes to extract as much of the original prints as possible while not restraining my hand’s wanderings too much. These are my drafts. I hope to develop these further, and am open to your thoughts. Some of these fellas are pretty beat up, and I referenced the others to determine how I would fill missing data. Like other kings found on early playing cards, they have a sort of throne (French/English cards had their kings take a stand). Upon closer inspection,they seem to be kneeling, so I was able to give the king of coins a foot. Damage, crude production techniques and early stages of design means this suit doesn’t translate well to modern eyes. I confess I want to see the cudgel more clearly defined. The ace of clubs is one of the few missing cards, and one more complex to replicate than I’d care for. 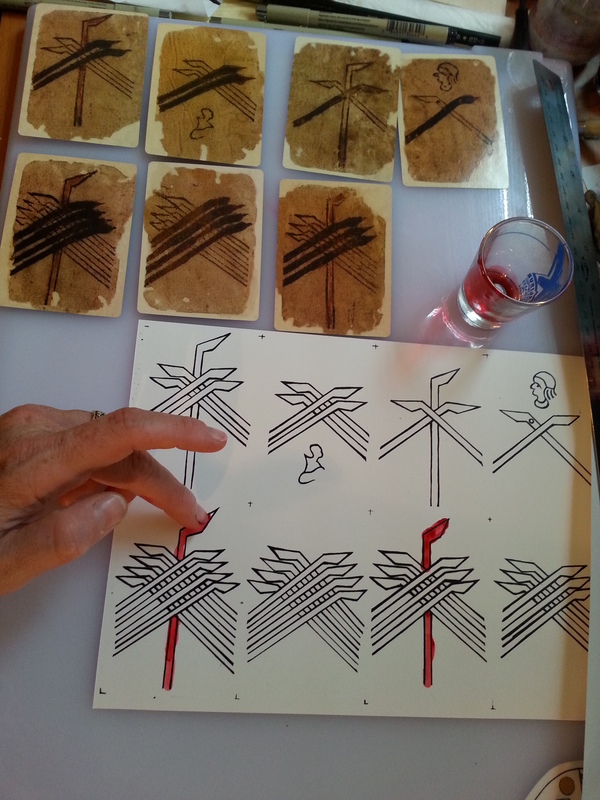 Unlike the court cards, the other clubs bear what resemble polo sticks from Mamluk cards. so does the ace have a polo stick, a cudgel, or, considering it’s possible Italian origins, a baton? It occurred to me that at some point the line between the two blurred. Specimens this old are so scarce as to make for few references, and those few packs don’t reveal quite enough to feel firmly about any of them except, perhaps, stocky and ornamented with botanicals. Two sheets of a Pattern called Moorish have been found in Barcelona, Spain. They are largely comprised of the suit of cups, which strongly resemble Mamluk cups. Although there are no court cards, the aces all survive. 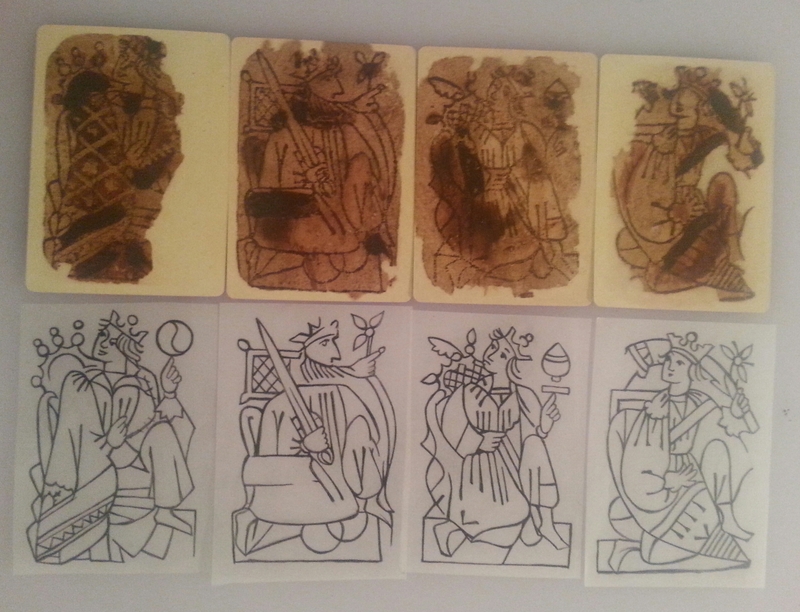 As the only known cards that may predate the a la Morisca cards (finger painted, made in Europe), It makes a strong case as an influence. 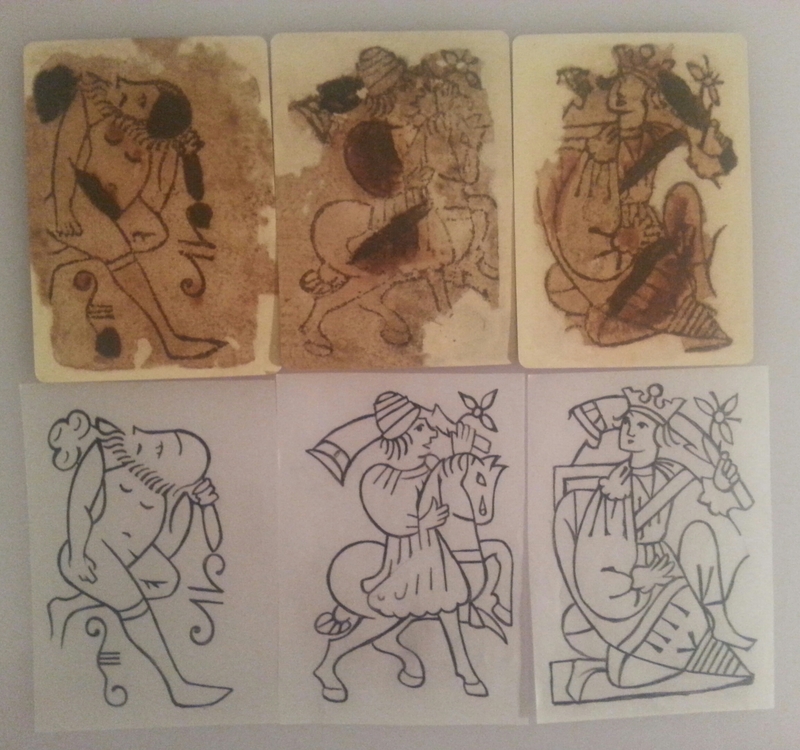 The date of 1390 (or anytime prior to the beginning of the 15th c) suggests that these are amongst the earliest known specimens of xylography in Europe. Indeed, they appear very simple, and after carving my own pack, I can see that the printer had one objective: mass, low cost production. These have very little to do with the beautiful hand-painted packs that began to be commissioned by Italian, French and German nobility, which were likely intended more as curios and fancy gifts. These were meant to be played. The 1370s is when ordinances, sermons, and other documentary references to playing cards (that scholars generally agree upon) begin to appear. The spread seems remarkably accelerated in certain areas. There is, to date, not enough evidence to say with any conviction how cards were introduced to Europeans, other than it was likely through Saracen influenced lands in Spain and/or Italy. 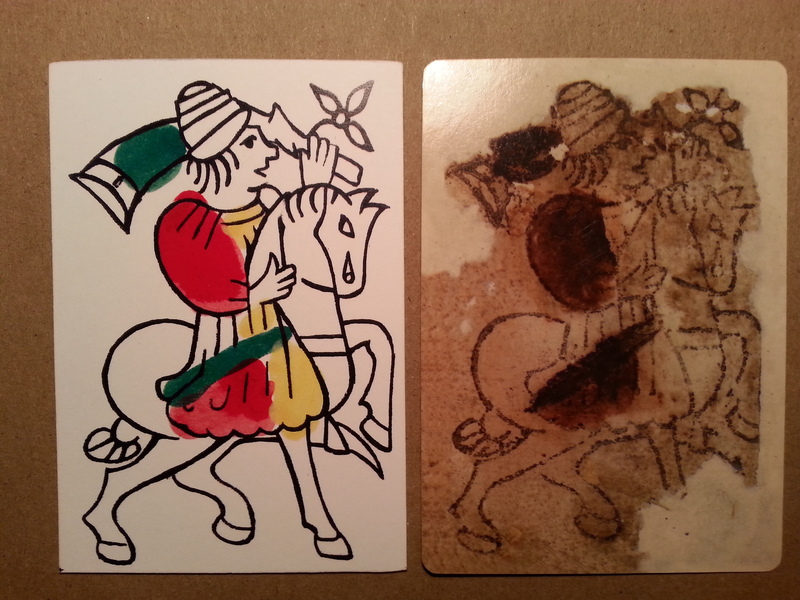 The few existing examples of Mamluk cards were hand painted, and, methinks, unlikely to cause enough community disruptions as to merit the need for ordinances. 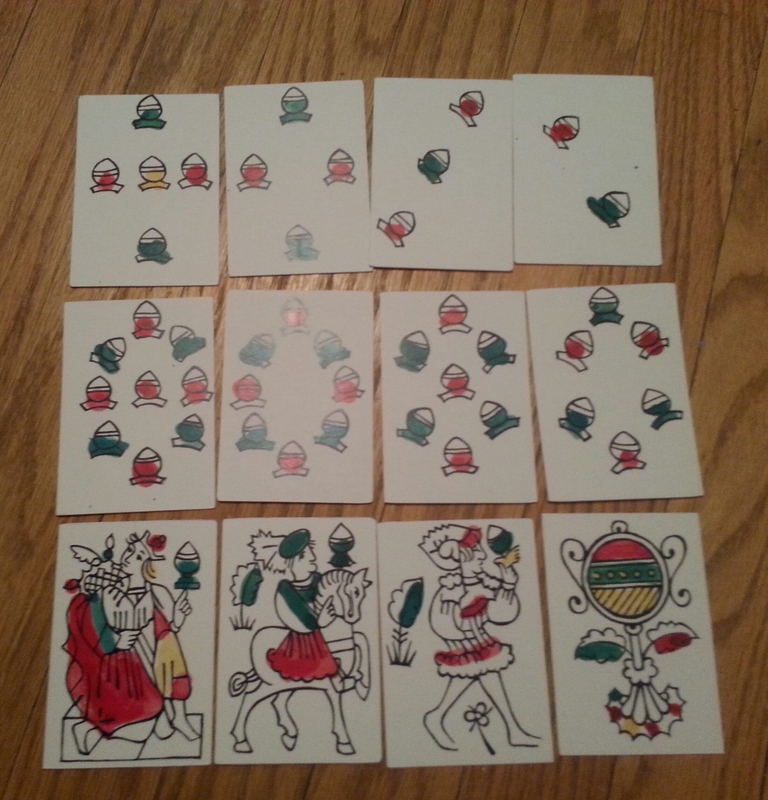 The Moorish pattern with the cups and aces may predate the a la morisca cards, and certainly seem to reinforce a Spanish production ground for Asian style cards. I suspect the cards became popular (and therefore problematic) because someone figured out how to print them. These are printed on a thicker paper to handle wet paint. As they line up, they show how the design builds on itself, and doesn’t really allow for the tens. OMG I’m finger painting playing cards! Suit of coins. Four and five have been replaced. Suit of Clubs/polo sticks. Ace and six are replaced. Suit of swords. Nine and Sota/Jack are replaced. Suit of cups. Replaced two and four. 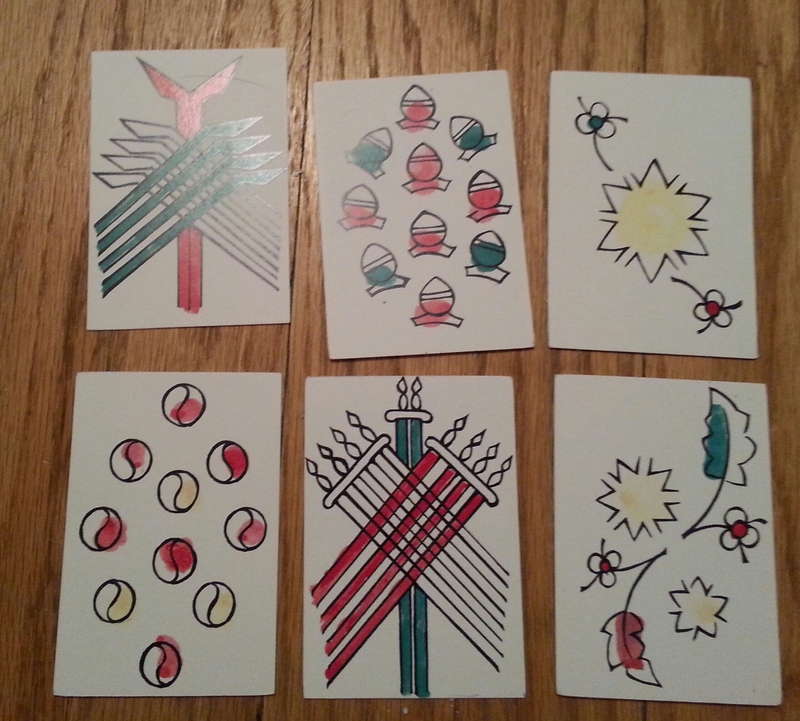 Anachronistic tens and jokers for versatile play. I received a wonderful compliment today! As I was (oh dear do I want to admit this?!?) working on DAUPHINE v.2 in the break room of my mundane employment, Some of the young gentlemen querried about my project. I Pulled the Morisca pack from my bag as I told them about studying cards. I wasn’t quite sure how to reconstruct the [knight of clubs], due to so much of the card missing, the fact the cudgel goes behind his head, and the limited amount of paint. Miguel spotted it, without any doubt or hesitation. YAY!!!! 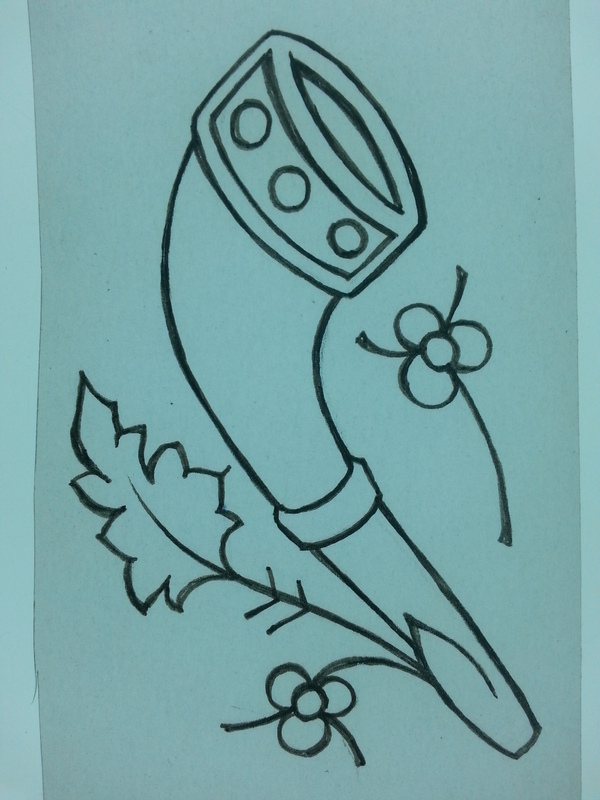 If you have a few minutes and want to read about Moorish playing cards please click on the link below and read Lady Heather’s post! Google, and located that it is truly informative. I’m going to watch out for brussels.